Update: Thanks to Chris’s insightful comment, the title of this post should have been “Context Sensitive Identifiers“. “override” and “final” are not C++ keywords; they are identifiers with special meaning. If maintaining backward compatibility is important, then introducing a new keyword into a programming language is always a serious affair. Introducing a new keyword that is already used in millions of lines of existing code as an identifier (class name, namespace name, variable name, etc), can break a lot of product code and discourage people from upgrading their compilers and using the new language/library features. Unlike other languages, backward compatibility is a “feature” (not a “meh“) in C++. Thus, the proposed introduction of a new keyword is highly scrutinized by the standards committee when core language improvements are considered. This is the main reason why the verbosity-reducing “auto” keyword wasn’t added until the C++11 standard was hatched. Even though Bjarne Stroustrup designed/implemented “auto” in C++ over 30 years ago to provide for convenient compiler type deduction, the priority for backward compatibility with C caused it to be sh*t-canned for decades. However, since (hopefully) nobody uses it in C code anymore (“auto” is the default storage type for all C local variables – so why be redundant? ), the time was deemed right to include it in the C++11 release. Of course, some really, really old C/C++ code will get broken when compiled under a new C++11 compiler, but the breakage won’t be as dire as if “auto” had made it into the earlier C++98 or C++03 standards. With the seriousness of keyword introduction in mind, one might wonder why the “override” and “final” keywords were added to C++11. Surely, they’re so common that millions of lines of C/C++ legacy code will get broken. D’oh! But wait! To severely limit code-breakage, the “override” and “final” keywords are defined to be context sensitive. Unless they’re used in a purposefully narrow, position-specific way, C++11 compilers will reject the source code that contains them. 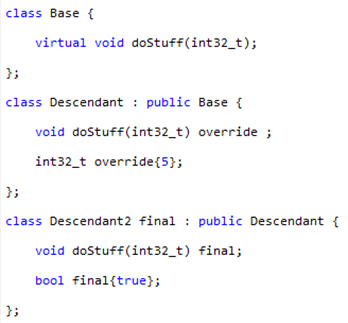 The “final” keyword (used to explicitly prevent further inheritance and/or virtual function overriding) can only be used to qualify a class definition or a virtual function declaration. The closely related “override” keyword (used to prevent careless mistakes when declaring a virtual function) can only be used to qualify a virtual function. 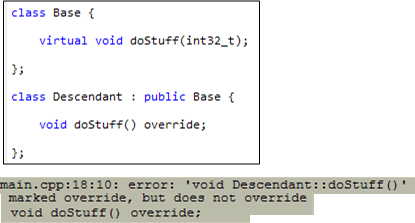 The figure below shows how “final” and “override” clarify programmer intention and prevent accidental mistakes. 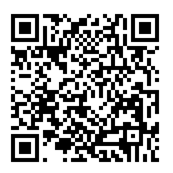 The point of this last code fragment is to show that the introduction of context-specific keywords is highly unlikely to break existing code. And that’s a good thing. It could be worth noting that you cannot give variables a name that is a keyword. This would seem to contradict your post, but the difference with override and final is that they are not keywords, but identifiers with special meaning within their specific contexts. Yes, you’re right Chris. According to cppreference.com, “override” and “final” are indeed “identifiers with special meaning”. Lazy, crappy research on my part – but that’s nothing new 🙂 . I reference N3163 which is a solid explanation of the thought process that went into this choice, the fact that C++/CLI had been using this technique since 2005 was a new and interesting tidbit.